Rothenburg ob der Tauber is a cute medieval town in Germany that is the perfect place to spend a day or two. Rothenburg has a lot to offer visitors, including photo-perfect medieval views, tons of shopping, a few interesting museums, a spectacular 500-year-old wood carving, and one of the funniest one-hour walking tours in Germany. Rothenburg is also the place to go if you want to get into the Christmas spirit as it hosts one of the most popular Christmas markets in the world. 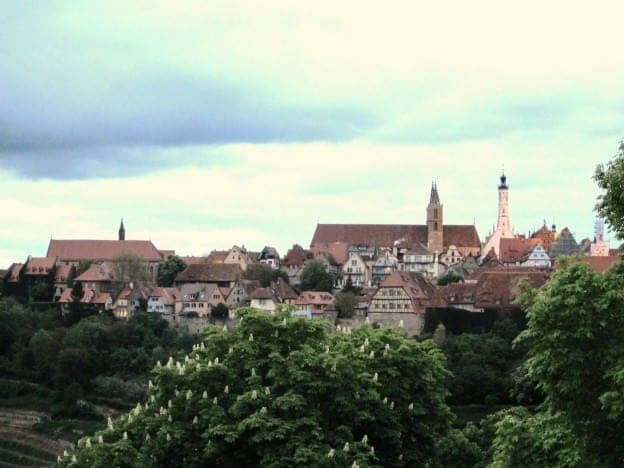 So if you are planning a trip to Rothenburg ob der Tauber, we’ll provide you with a good general guide of how to plan a day in Rothenburg, give you our top seven things to do in Rothenburg, and provide tips based on our own visit to Rothenburg. You can arrive and depart via car, train, or bus. By Car: First, make sure you follow your map or set your GPS to Rothenberg ob der Tauber and not one of the other Rothenburgs in Germany. If you are staying in a hotel or apartment within the Old Town, you should check to see if they have a designated parking area. If not, you can always drive in and drop off your luggage, but the public parking areas are located right outside the Old Town that line the outside of the town walls. It is about a 7 minute walk from the parking lots to the main square in Rothenburg’s Old Town and parking is 5 euros per day. By Train: Rothenburg ob der Tauber has a small train station that is located a 10 minute walk or a 2-minute taxi ride from the main squire in Rothenburg’s Old Town. By Bus: If you are interested in driving along the Romantic Road, but don’t have a car, you can take the Romantic Road Coach, which is a seasonal daily bus that stops in Rothenburg and several other stops along this popular route. However, the bus only stops for a short time in Rothenburg so to really spend any time here it would be wise to get off and overnight here and wait to depart the next day. Check the website for details about stops and ticket prices. 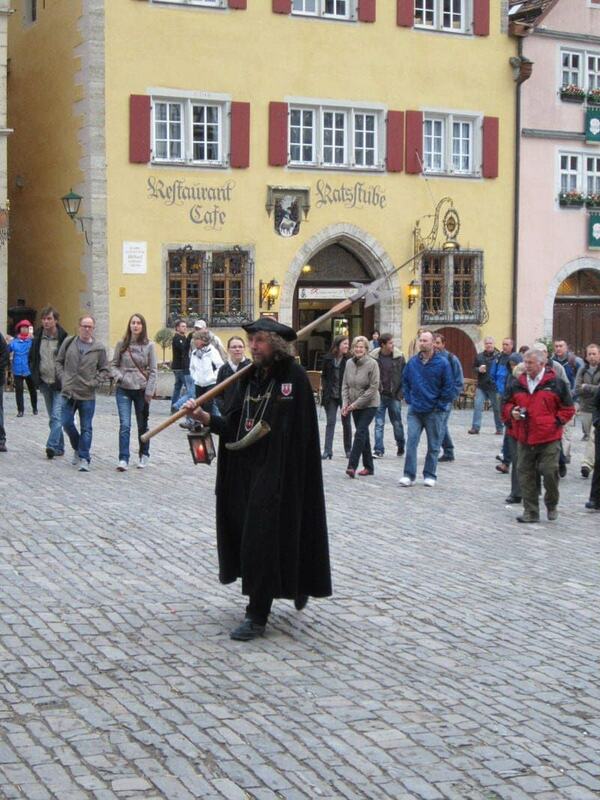 Tour: Tour companies like Viator also sell day, overnight, and multi-day tours that include stops or overnight stays in Rothenburg. How Long Should I Spend in Rothenburg? This is a matter of preference and certainly you can walk around the town and take in some good views in a couple of hours. You can get a good overview of the town during a day trip. However, I would recommend at least one day (preferably two) and one night to really allow yourself enough time to explore Rothenburg. To plan your time, I would make a list of the things you want to do here and then calculate how long you’ll need for each. A couple of nights here would allow you the luxury of setting a slow pace in exploring this medieval town. When Is the Best Time to Visit Rothenburg ob der Tauber? Well, this all depends. If you want the best weather, come during Spring, Summer, or early Fall. If you want the most festive time, come during the month of December for the Christmas market when everything in Rothenburg is at its busiest. If you want to avoid tons of tourists, avoid Spring, Summer, early Fall, and the entire month of December. Unfortunately, Rothenburg is a very popular town and draws a lot of crowds so if you go during good weather or during a festival or Christmas market, expect crowds. However, if you stay overnight in Rothenburg, you’ll likely be able to enjoy peaceful mornings and evenings as most visitors come only for the day. 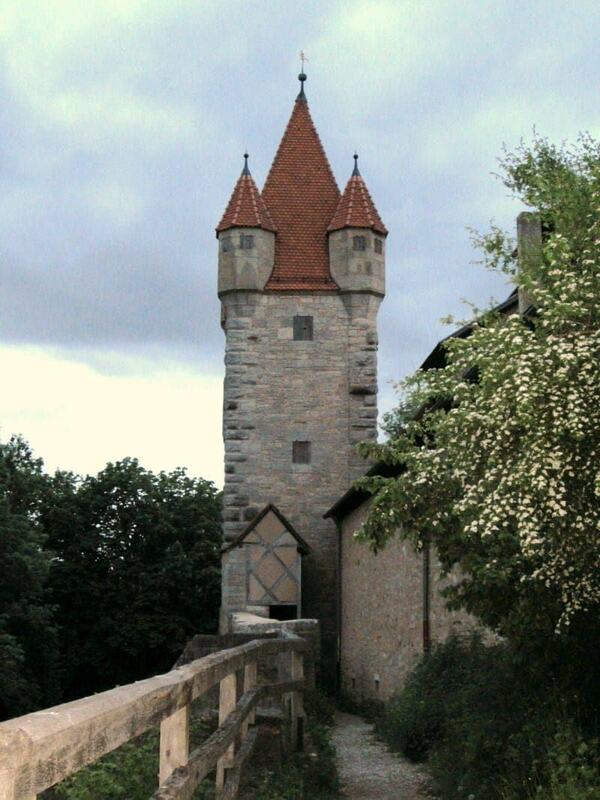 Where Can I Find More Information about Rothenburg ob der Tauber? Two great resources are the official tourism website for Rothenberg ob der Tauber and the Rothenburg ob der Tauber Tourism Office located on Market Square (Marktplatz 2, telephone: 09861/404-800). Check the website’s event calendar as Rothenburg hosts a number of festivals and events during the year. Our favorite thing to do in Rothenburg is to simply take a walk and admire the views. The town is small and easy to stroll on your own. However, you have a lot of options. You can take a self-guided walk with a good guidebook, take a group or private walk led by a guide from the Tourist Information office (Marktplatz 2), and/or go on the almost daily Night Watchman’s Tour. 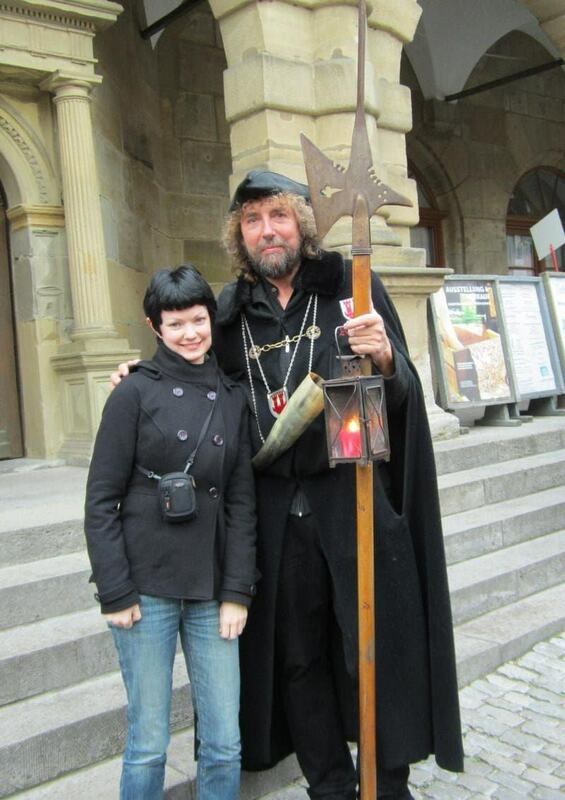 I would recommend doing a more serious tour of the main sites during the day and then head to the Market Square at 20:00 (8:00pm) to join the Night Watchman (real name Hans-Georg Baumgartner) for an entertaining 60-minute medieval tour in English. Early mornings and evenings are the best time to take a walk and avoid other tourists, but note the hours of any sights you want to visit along your stroll. If you have two or more days to spend in town, You might also consider renting a bike and exploring some of the countryside around Rothenburg. Rothenburg ob der Tauber is a shopping mecca for many visitors to Germany. While you can buy all the normal German souvenirs here from cuckoo clocks to beer steins, there are also some unique gifts that can be found here. Some of our favorites include original etchings of Rothenburg, Christmas tree ornaments, and a DVD from the Night Watchman. For a complete guide to shopping and souvenir ideas, check out our article devoted to shopping in Rothenburg. Also, note that investing in the latest edition Rick Steves Germany guidebook can save you money at several shops in Rothenburg. St. Jakob’s Church (St. Jackobskirche, a.k.a. St. James Church as “James” is “Jakob” in German) is the one must-see church in town (located at Klostergasse 15, can enter for a 2 euro fee, audioguide available for fee). This 14th century church holds the amazing 500-year-old Heiligblualtar (Holy Blood Altar) that was carved by Tilman Riemenschneider. 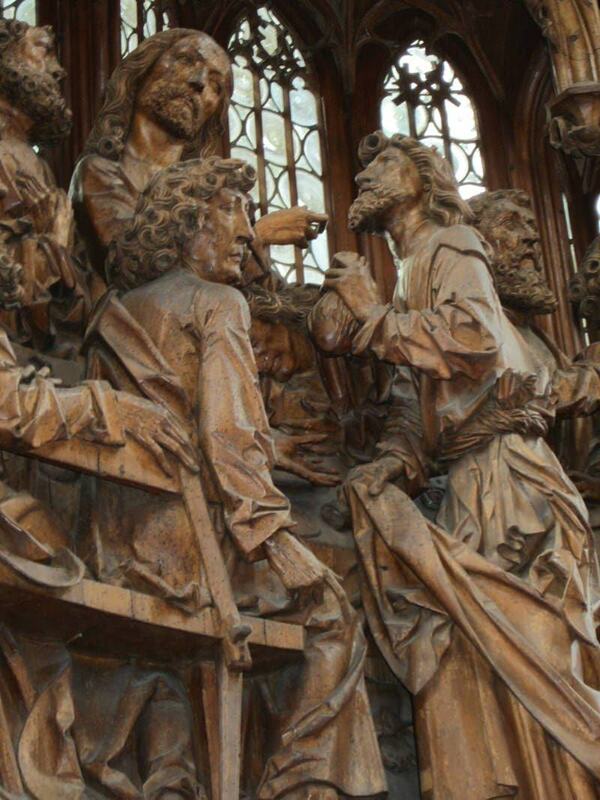 To find the wooden altar depicting the Biblical scenes of Jesus’ entry into Jerusalem, the Last Supper, and the Mount of Olives, look for a set of stairs at the back of the church that lead behind the pipe organ. 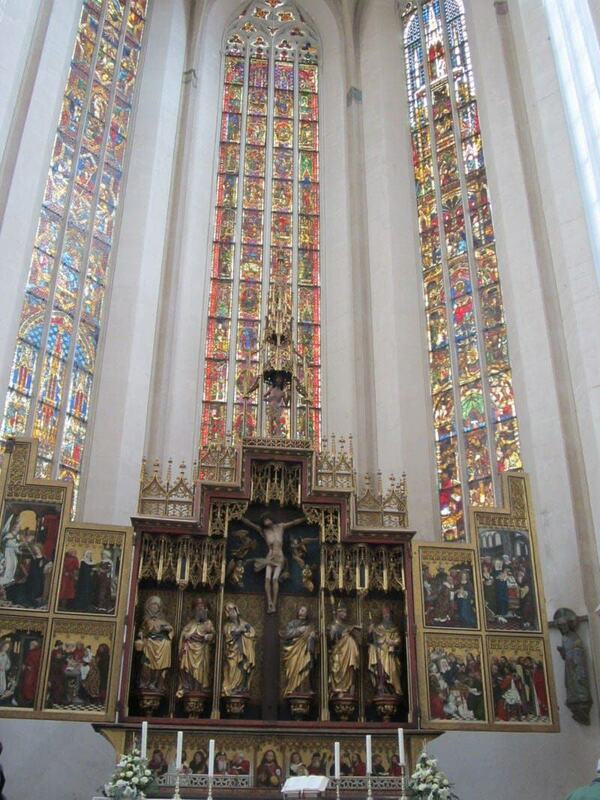 Also don’t forget to check out the rest of the church, including the stained glass windows and the High Altar (a.k.a. Twelve Apostles Altar), which are both worth a look. 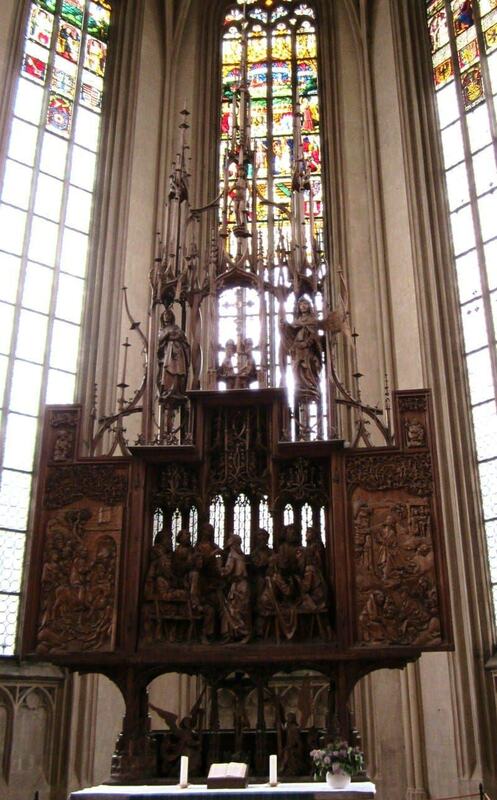 Other churches that are worth a peek if interested in old churches, are the 14th century Franciscan church (Franziskanerkirche, located on Herrngasse, free) and the 15th century Gothic St. Wolfgang’s Church (St. Wolfgangskirche, located north of the Klingentor, 1,50 euros). If you are interested in learning more about the churches of Rothenburg ob der Tauber, you can check out the main tourism website or this website on Rothenburg churches (in German). Rothenburg also has an interesting (although not very positive) Jewish history and is actually supposedly home to the only remaining Jewish late medieval street in Europe (Judengasse). 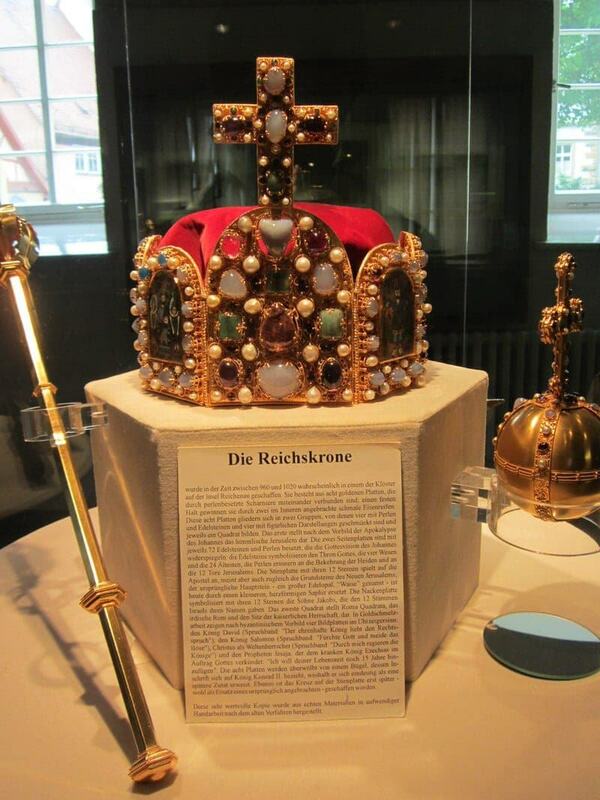 If you are interested in the Jewish history of Rothenberg, there is a good Jewish exhibit at the Reichsstadt-Museum and the Tourist Information office can guide you to remaining Jewish sights in town. 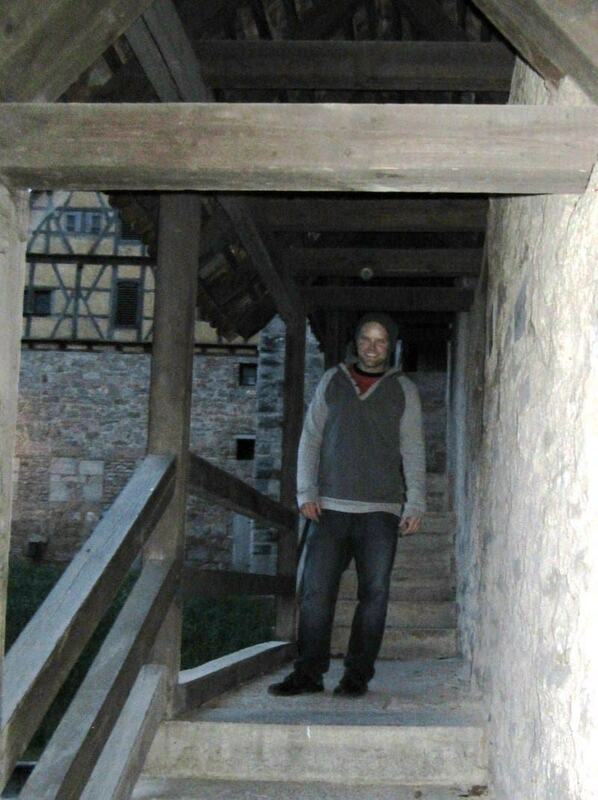 As noted above, walking around Rothenburg ob der Tauber is one of the best things to do while you are here. However, this town has the added fun of having the best preserved medieval walls in Germany and you are free to walk most of it. Most of the walk is also covered and we were able to do it even when it was raining a bit outside. There are many places you can enter, typically there are steps near the towers. While parts of the wall are the original medieval walls built in the 13th and 14th centuries, parts of the wall were destroyed by American bombs during World War II. However, the damaged walls were completely rebuilt with worldwide donations (you’ll see plaques of all the donors’ names as you walk along the wall). Make sure to take time to examine some of the gates and towers. Best times to go, first couple hours after sunrise or around sunset. We went around sunset and had our section of the wall almost to ourselves. Rothenburg is a great place to chow down on some Bavarian or Franconian specialties. If you want German food and a historical ambiance, there are several places serving up hearty Germany food in historical settings such as Altfränkische Weinstube, Baumeisterhaus, Reichs-Küchenmeister, and Gasthof Goldener Greifen, If you are on a very tight budget, try Bosporus Café (located at Hafengasse 2) for cheap Turkish food or pick up food at the little family grocery store (located at Rödergasse 6 below Pension Elke) and have yourself a picnic. We stayed in an apartment, and picked up deli meat, bread, fruit, and coffee at the grocery store for an inexpensive dinner. 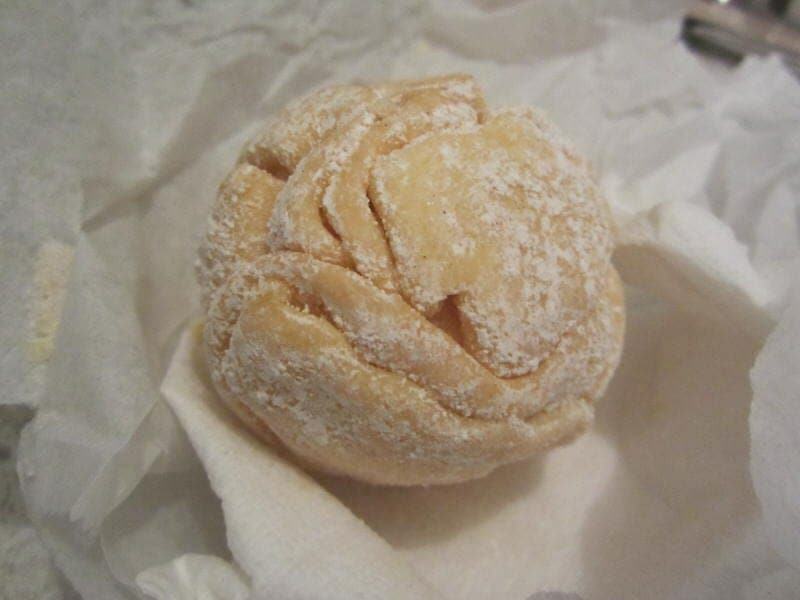 For local specialties, try one of the schneeballen (a Rothenburg pastry specialty which consists of pastry dough balls rolled in sugar, cinnamon or dipped in chocolate or frosting) and some of the local Franconian wine. It would be difficult—and a shame!—to visit Rothenburg and not learn at least a bit of its rich history. From its time as privileged imperial city to its demise during the Thirty Years’ War to its revival in the last century due to tourism, the town has an interesting and rich history. One of the best ways to learn about the city is to take one of the guided tours mentioned earlier or do a self-guided walk with a good guidebook. But the city also has a few interesting museums that are worth a stop. First the Imperial City Museum (Reichsstadt-Museum, Klosterhof 5, 4 euros) offers a good history of Rothenburg through the ages and is probably the best museum to visit to get a good detailed history of the city. You might also want to visit the Craftsman’s House (Alt-Rothebnburger Handwerker-haus, Alter Stadtgraben 26, 3 euros) for a look at everyday medieval life for craftsmen set in a house originally built in 1270 or, if you are willing to leave the town center, the Toppler Castle (Topplerschlösschen, Taubertalweg 100, 1,50 euros) which is a 14th century castle tower/house that contains furnishings from the 16th to 19th centuries. If you want to learn more about the Thirty Years’ War and the Meistertrunk (interesting story of how the mayor of Rothenburg saved the town by drinking a tankard of wine), you can pay a quick visit to the Historical Town Hall Vault & Dungeon (Historiengewölbe mit Staatsverlies, located at the Town Hall, 2,50 euros) or simply watch the free brief daily enactment of the famous event from the clock tower in Market Square. The most kid-friendly museum in Rothenburg is the privately-run Doll and Toy Museum (Puppen- und Spielzeugmuseum, Hofbronnengasse 13, 4 euros) which contains a large collection of dolls, model trains, stuffed animals, and other toys from the past 200 years. 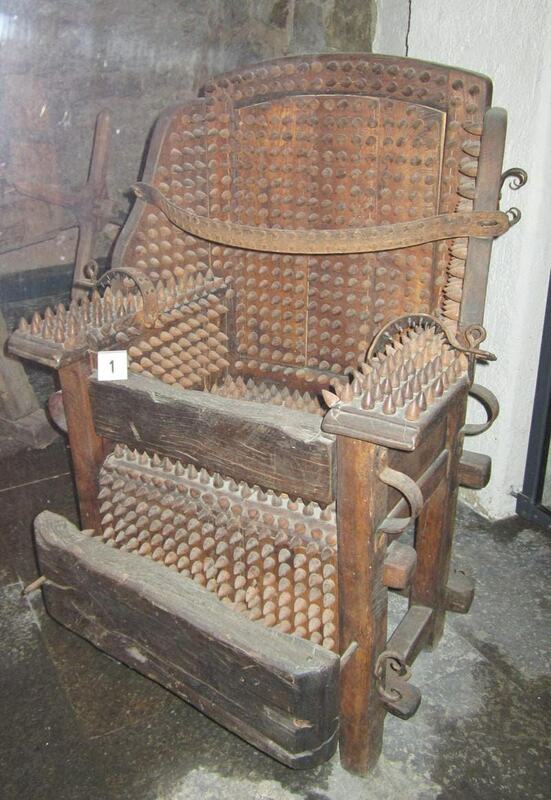 Perhaps the most unique museum in town is the Medieval Crime Museum (Mittelalterliches Kriminalmuseum, Burggasse 3, 5 euros) which is a unique and eclectic collection of items related to crime, torture, law, general history, and medieval customs. It contains a collection of old legal documents, penal codes, rules of etiquette, seals, coats of arms, shame masks, torture devices, and even a random collection of film posters. Ethan and I spent about 2 hours in this musuem and had to rush through as there is a lot of information here in English and we found it very interesting. Get into the Christmas Spirit. Rothenburg ob der Tauber is the perfect place to visit for those who love Christmas. First, it is the home to the head offices for Käthe Wohlfahrt stores, which sell traditional Christmas ornaments and the stores are open year-round. 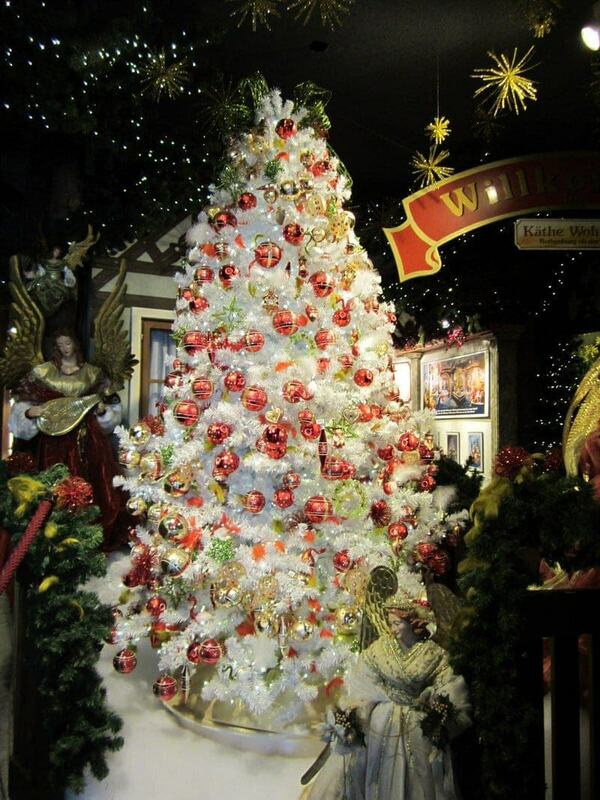 If you are really into Christmas, you can visit the small German Christmas Museum (Deutches Weihnachtsmuseum) located in the upstairs of the Käthe Wohlfahrt Christmas Village Shop (4 euro entry). Second, Rothenburg hosts one of the most popular Christmas markets in Germany from the end of November to Christmas. All the main sights are open during the Christmas Market (Reiterlesmarkt ) and it is the busiest time of year for this little town. We wish you a perfect day in Rothenburg ob der Tauber. Have you been to Rothenburg? Feel free to ask us questions or share you own travel stories or tips to this town. Wandering the streets of Rothenburg felt like stepping into the pages of a fairy tale! The link to the local grocer was invaluable. It’s nearly impossible to find such entities (convenience store, ATM, self-serve laundry) on any website when trying to plan a trip. Very wise. Very helpful. Much obliged. Glad this was helpful bdj! We bought sandwich food and snacks at the grocery store for dinner one night in Rothenburg. Thanks for sharing this! I love Germany and am such a fan of visiting Germany! 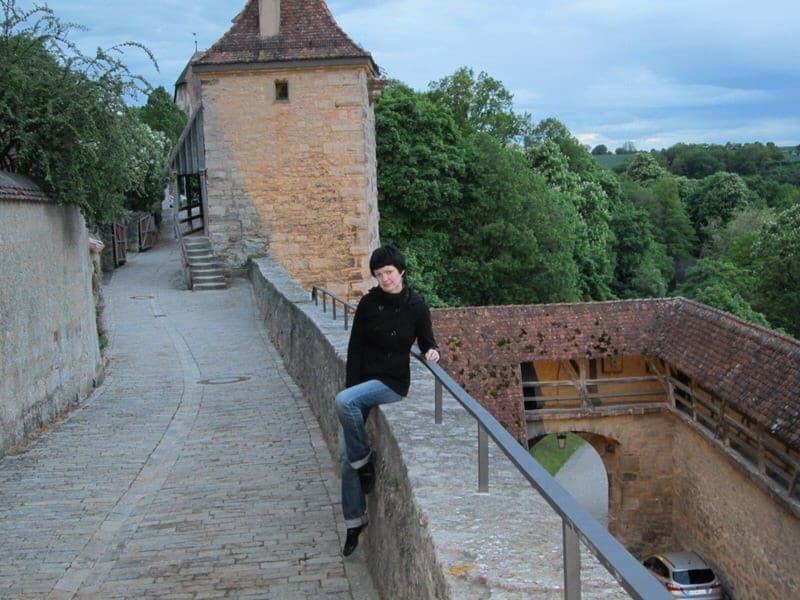 Glad you enjoyed the post on Rothenburg ob der Tauber! We are big fans of Germany too. Great pics! 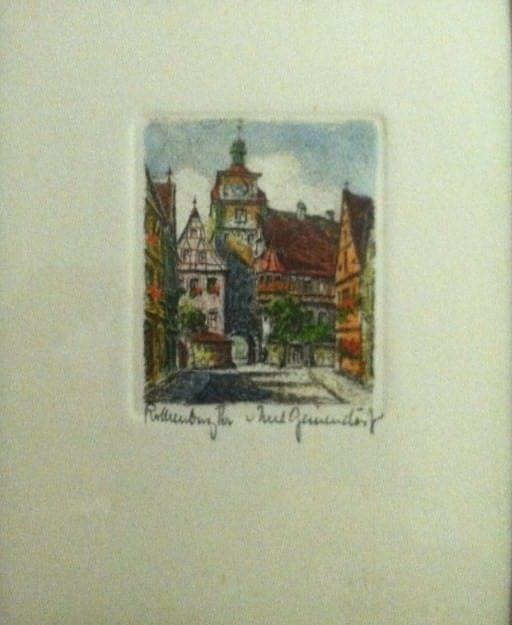 I love that etching of Rothenburg. All these pics I’m seeing on travel blogs of Germany are making me very keen to go back there. Thanks Louisa, Germany is a very pretty place, but I love all your pictures from Italy and can’t wait to visit there!